John J Robinson attempts to reinterpret old events in a new, fresh manner, which has a tendency to make historians and fans alike, a little nervous. 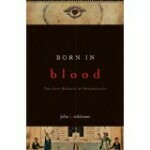 Within the chapters and pages of Born in Blood is a unique and fresh approach to Freemason history. Most of the Masons five million plus members believe that Freemasonry developed from the medieval federations of stonemasons. Robinson attempts to prove there is a very different origin for the largest fraternal organization in the world. Born in Blood challenges primordial conceptions by offering explanations and links to the Freemasons and the previously influential, commanding and powerful Knights Templar sect. Robinson claims that due to progressive and violent persecution, the Knights were forced underground, compelled to become a secret subversive society steeped in secrecy, politics, religious, economical and social dedication to self-improvement and contribution, all while maintaining the high level of clandestine sacrament and symbology. While many may question the new information established within Robinson’s born in Blood, there is clear evidence within Robinson’s supposition that allows obvious and comprehensible clarity to precedent Freemason inquiry, convincing even the most inquisitive skeptic to take another look at the idea that the medieval revolt against feudal property owners and various establishments of royalty was a highly organized, premeditated upheaval, not by the hoc people, but by the Knights Templar to get revenge against their adversaries and persecutors. Robinson further contends that the leader of the peasant revolt was a Mason leader named Walter the Tyler, providing a never-before examined link between the peasant medieval revolt and the Knights Templar and the Freemasons. Additional evidence is provided by retracing the history of the Knights of the Temple of Solomon and the examination of certain rituals, secret handshakes, knocks and other aspects of enigmatic rites in order to distinguish one another. Robinson argues that the Masons have similar ciphers and surreptitious mannerisms in order to differentiate one another. Within the plethora of assertions within Born in Blood, Robinson demolishes the idea that Freemasonry developed from the medieval stonemasons because during his lengthy research process, Robinson was unable to find a single documented case of a medieval guild of English stonemasons, leading him to believe that the Freemasonry sect arose from a separate entity. The premise behind Robinson’s innovative declarations is shrouded in the Masons oaths of secrecy. Such oaths include that revealing Mason secrets would end in the informant having his throat cut, his tongue ripped out by the roots, amongst other gruesome threats. Robinson further contends that this type of secret oath makes better sense coming from those who have been the subject of religious persecution and discrimination than those who are simply English stonemasons. Robinson challenges that the veneer of stonemasonry was simply the easiest and most available cover story, forming an irrefutable disguise for secretive Freemasons. The Born in Blood story offers a different narrative regarding the secret histories and derivation for the Freemason group, albeit without a solid historical foundation. While many of Robinson’s theories are lacking in solid historical proof, they do provide a new twist on common unanswered aspects of the Freemason chronicle, offering pioneering suggestions for the inspiration of one of the oldest, largest alliances in history. While the story is an interesting convert, and does allow the reader to form a new hypothesis, Robinson fails to fully deliver factually based information that can point to the actual origins of the Freemasons, although, he does raise interesting and appealing ideas that offer answers to difficult queries.